August 4, 2016 — Links International Journal of Socialist Renewal — What many of us feared on the night of July 15 has occurred in the most sombre way possible. 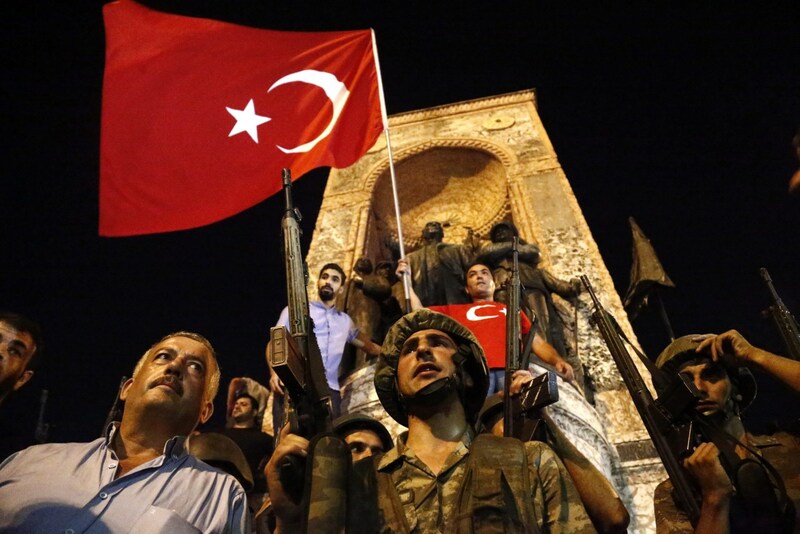 If a victorious coup in Turkey would have been terrible, its failure looks set to be no less so. In barely a week, President Recep Tayyip Erdogan has detained or purged more than 40,000 public officials: army officers, police, judges, teachers, and journalists. He has declared a state of emergency for three months - which can be extended indefinitely - and has suspended the European Convention of Human Rights, which could open the way – as the government has already insinuated - to the reestablishment of the death penalty and, in any case, normalise repression against all forms of opposition, particularly against the Gulenist forces and the Kurds, who have once again, following the reinitiating of the military conflict a year ago, been converted into the “internal enemy”. In short, to stop or avenge a coup - real and manipulated - Erdogan and his party have at the same time carried out a coup. US President Barack Obama fetes the late King Abdullah of Saudi Arabia. April 19, 2015 -- Antipodean Atheist, posted at Links International Journal of Socialist Renewal with author's permission -- Saudi Arabia’s aerial offensive against Yemen has continued for the fourth week at the time of writing. Yemen is undergoing a humanitarian crisis, with millions of Yemenis lacking basic access to food, clean drinking water and health care. The Saudi bombardment has only worsened the plight of the Yemenis, with schools destroyed, hospitals and health-care facilities targeted, and electricity supplies cut off. Basic infrastructure is being shattered, thus precipitating a catastrophic health situation for Yemeni residents. April 13, 2015 -- Green Left Weekly, posted at Links International Joural of Socialist Renewal -- The United States is providing crucial support to regional ally Saudi Arabia ― a big buyer of US arms ― as it launches a new war in the Middle East by attacking neighbouring Yemen. A Saudi-led coalition of Western-aligned, mainly Sunni Islamist, Arab government's launched air, naval and ground military offensive against Yemen on March 25. Saudi Arabian forces are being supported by military planes from the United Arab Emirates, Qatar, Bahrain, Kuwait, Jordan, Morocco, Sudan and Egypt, which is also supplying naval forces. The military intervention is in support of Abd Rabbuh Mansur Hadi, the Yemen president overthrown in January by a coalition led by Ansar Allah, also known as the Houthi movement. Ansar Allah is an armed movement based in the Zaydi religious minority, who are about 35% of Yemen's population. The Saudi intervention has accelerated the civil war engulfing Yemen. More than 334,000 people have been internally displaced and 254,400 have fled abroad. March 1, 2015 -- Middle East Monitor, posted at Links International Journal of Socialist Renewal -- Over four years since mass uprisings ousted sclerotic regimes in Tunisia and Egypt it can seem that the initial hopes represented by these movements lie in tatters. Libya, Syria, Yemen and Iraq remain mired in bloody armed conflicts that have led to the deaths of hundreds of thousands and displaced millions more within and across borders. In the pivotal case of Egypt, military rule has returned through the violent crushing of protests, the arrests of an estimated 40,000 people and the rebuilding of the repressive structures of the Hosni Mubarak era. Elsewhere, autocratic governments look more secure in their rule today than they have for many years. Photograph of Dubai metropolis by Mohamed Somji, flic.kr/p/GYvne. October 6, 2014 -- rs21 -- Adam Hanieh is a senior lecturer at and School of Oriental and African Studies in London and author of Lineages of Revolt: Issues of Contemporary Capitalism in the Middle East. He spoke to Bill Crane about his book and on the trajectories of the Arab revolutions since 2011. Aftermath of the latest US airstrikes on Syria. September 25, 2014 -- Syrian Revolution Commentary and Analysis, submitted to Links International Journal of Socialist Renewal by the author -- In extraordinary developments, the United States, Saudi Arabia, the United Arab Emirates, Qatar and Jordan have launched a joint air war, on Syrian territory, with the full support of the Syrian tyranny of Bashar al-Assad, on the Islamic State of Iraq and Sham (ISIS, now also referred to as Islamic State, IS). There are plenty of good reasons to oppose any US war in any circumstances; and in this case, a war that is targeting only the Sunni-sectarian ISIS, yet sparing the viciously anti-Sunni Assad regime, indeed collaborating with the regimethat is responsible for a hundred times more massacre and destruction than ISIS, with which it has long collaborated in any case, is likely to boost support for ISIS among a large section of the poverty-stricken, dispossessed Sunni majority. 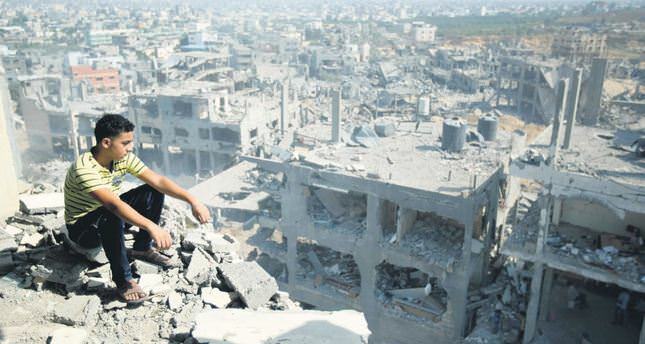 Massive destruction of Gaza by Israel has left Palestinians devastated. August 14, 2014 – Links International Journal of Socialist Renewal, from Spanish at Cuartopoder.es -- Let’s imagine a Syrian who was dreaming of enjoying a little bit of democracy, a little bit of freedom, a little bit of social justice: in short, of enjoying a little human dignity. Which forces, and how many of them, would he or she have to struggle against? First, against a dynastic dictatorship that, for more than 40 years, has repressed, impoverished and murdered its own people and that, for the last three years, has not hesitated to resort to torture, extrajudicial executions, aerial bombardment and even chemical weapons, not to mention spreading sectarian poison and the most abject propaganda. June 27, 2014, BBC map of the gains made by ISIS. June 25, 2014 -- Syrian Revolution Commentary and Analysis, posted at Links International Journal of Socialist Renewal with permission -- As a coalition of Sunni-based forces, including the Islamic State of Iraq and Sham (ISIS), took the major northern Iraqi city of Mosul and then most of the Sunni heartland in the north and west of Iraq, regional and western capitals went into crisis mode: the entire post-US occupation stabilisation had collapsed in a heap. June 3, 2014 -- Syrian Revolution Commentary and Analysis, posted at Links International Journal of Socialist Renewal with permission -- Over the last year, the sectarian (mainly Sunni versus Alawite) element of the Syrian conflict has markedly grown, within an uprising that began as a multi-sectarian popular democratic uprising against Syria’s tyrannical regime of Bashar al-Assad. The hold of Sunni sectarianism is by no means universal among the insurgent Syrian masses and their myriad of civil and armed resistance organisations; on the contrary, despite persistent myths, the revolution still contains a powerful secular wing (both within the civil uprising and the Free Syrian Army), and even the largest parts of the clearly political-Islamist wings are not specifically sectarian; and many are markedly moderate Islamists. 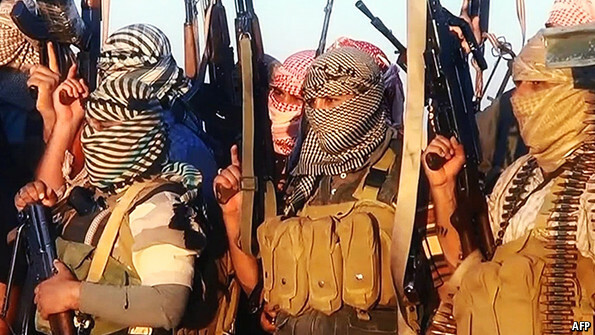 However, there is no denying that a dangerous level of Sunni sectarianism has grown, especially among the more extreme ‘jihadist’ fringe affiliated to al-Qaida, and that this is an entirely negative and reactionary development. March 15, 2014 – Links International Journal of Socialist Renewal -- The year 2011 saw uprisings throughout the Middle East and North Africa. They were portrayed in the Western media as rebellions against dictatorial regimes and for democracy. But that is only part of the story. Political discontent was combined with economic discontent, as reflected in the widespread slogan, “bread, freedom and social justice”. Jadaliyya: What made you write this book and what are its key themes? Adam Hanieh: The book was written over the course of 2011 and 2012 and was intended as a contribution to some of the debates that emerged in these first years of the Arab uprisings. I did not want to write another narrative account of the uprisings themselves. This was partly because these were events still unfolding and shifting rapidly from day to day; it was also because there had already been several very useful books published along these lines, including, of course, Jadaliyya’s The Dawn of the Arab Uprisings. United States, Iran, Russia, Syria and the geopolitical shift: Anything for the region’s oppressed? Russia's foreign minister Sergey Lavrov (right) and US Secretary of State John Kerry during a May 2013 joint press conference in Moscow on "finding ... common ground" on the conflict in Syria. Click HERE for more on Syria. December 19, 2013 -- Syrian Revolution Commentary and Analysis, posted at Links International Journal of Socialist Renewal with the author's permission -- In recent weeks and months, a pronounced geopolitical shift in US policy related to the Middle East has been widely discussed. This shift consists mainly of the US-Russia deal with Syria’s Assad regime to get rid of its chemical arsenal, in exchange for the US dropping its brief threat of air strikes over Assad’s chemical attack on August 21; and the high-level US-Iran negotiations over its nuclear arsenal, which led to a new agreement, involving a slight reduction on imperialist sanctions on Iran in exchange for Iranian concessions on its civilian nuclear program. 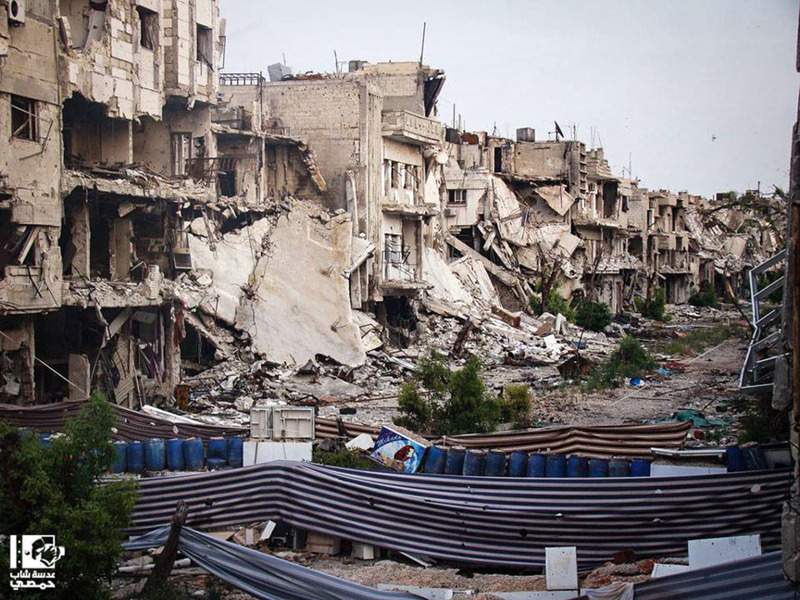 A street in Homs shows the extent of damage by government forces during the two-year conflict in Syria. The image taken on May 14 was provided to Syria Witness by Lens Young Homsi. July 9, 2013 – Links International Journal of Socialist Renewal -- Recent weeks saw seemingly contradictory developments regarding imperialist plans for Syria. First, on June 14, the US government announced it had finally agreed to provide some small arms directly to “vetted” sections of the Syrian armed opposition, following alleged US “confirmation” that Syria’s Assad regime had used chemical weapons. Then on June 18, the G8 meeting between the US, Russia and six other major imperialist powers issued a joint declaration calling for all parties to the Syrian conflict to attend the Geneva peace summit, declaring the need for a political solution. 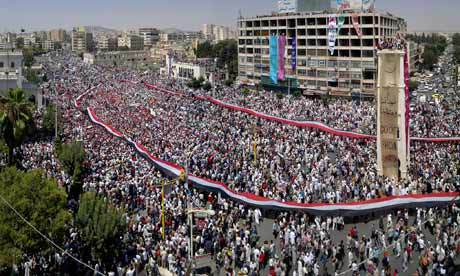 Non-violent Syrian demonstrators, July 2011. Photo: AP. 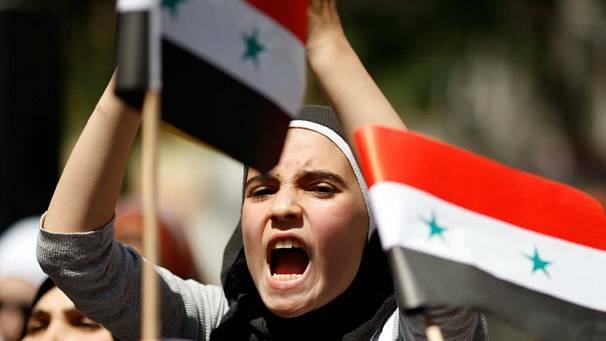 June 2013 -- Campaign for Peace and Democracy -- More than two years ago, the Syrian people, inspired by the Arab Spring, began a democratic revolution against the viciously authoritarian Bashir al-Assad regime, a revolution that we enthusiastically supported from its beginning and continue to support. For two long years now, we, like the rest of the world, have watched in horror as the Syrian government waged merciless war on its own people. Some of the revolutionaries argued that for strategic if not for pacifist reasons, the movement should have remained non-violent despite the mounting repression it faced. However, the extreme violence and unspeakable cruelty, including the use of torture on a massive scale, that Assad unleashed against an initially peaceful democratic movement impelled many of the regime's opponents to take up arms, understandably believing that they had no choice other than outright surrender, which would be followed inevitably by mass slaughter. Some of the rebels have also committed atrocities; these are indefensible, but it should be remembered that it is the Assad regime that has been the initiator and far and away the greatest perpetrator of violent outrages. May 11, 2013 – Links International Journal of Socialist Renewal -- In the wake of two Israeli airstrikes on targets in Syria on the May 4-5 weekend, the second causing massive explosions close to Damascus and killing at least several dozen Syrian troops, discussion rages about the aims of this aggression and the relationship it has to the ongoing mass uprising and civil war in Syria. Israel claimed both attacks were aimed at Iranian long-range rockets, or the military depots where they were housed, that were in transit via Syria to Hezbollah in Lebanon. As the Zionist regime has continually indicated that its “red line” was the transfer of any significant “game-changing” weaponry to either Hezbollah in Lebanon (which is currently aligned to Syria’s besieged Assad regime) or to the Sunni Islamist rebels fighting to overthrow that regime, this explanation seems plausible. 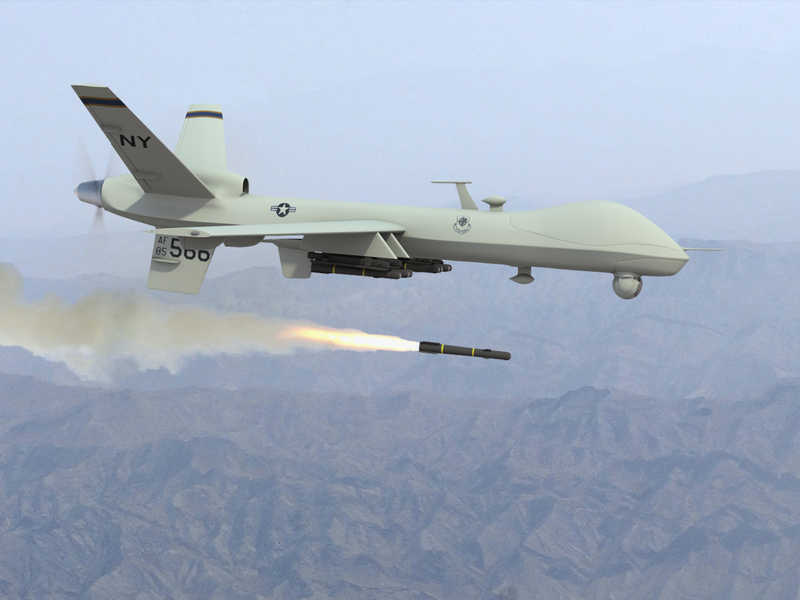 The United State’s robot wars in Yemen, Somalia, Afghanistan and other countries is the logical outcome of a shadowy war that has no definition and with no end in sight. January 7, 2013 -- Antipodean Athiest, submitted to Links International Journal of Socialist Renewal by the author -- The US National Defense Authorisation Act, updated by the administration of US President Barack Obama for 2013, has been signed into law. It provides for the indefinite detention of any person suspected of "terrorism" offences, prohibits the transfer of the remaining Guantanamo Bay detainees from that facility and allows the US military to detain any person, even US citizens without any recourse to civilian courts and legal access. Obama, the "anti-war" candidate of 2008, has not only continued the Bush-Cheney-era "war on terror", he is ensuring that its continuation, its corrosive effect on civil liberties and the undermining of the already fragile democratic rights will go on spreading its toxic effect. August 13, 2012 – Links International Journal of Socialist Renewal -- The continuing mass uprising against Syria’s Bashar Assad dictatorship on the one hand, and the growing intervention by the reactionary Gulf monarchies of Saudi Arabia and Qatar, along with Turkey, on the side of the growing armed insurgency on the other, has led to a situation where many on the left are sharply divided over who to “support”. Some claim the Saudi-led covert intervention requires support for Assad’s bloody regime as a lesser evil “secular” alternative to what they believe is an inevitable “jihadi” regime, given the rise of a vicious Sunni sectarian aspect to the civil war and the Saudi-led backing of such forces. Also, given the largely verbal (until recently) support given to the Gulf states’ intervention by the US and other imperialist states, support for Assad against this allegedly “imperialist-backed” assault on Syria is necessary to prevent the destruction of the Syrian state, which they allege imperialism desires due to Assad’s alleged anti-imperialist credentials (which even most of these writers, however, admit is very tenuous at best). 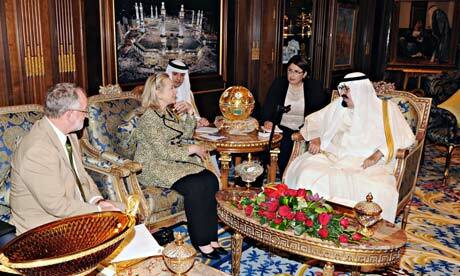 Hillary Clinton (centre) meets King Abdullah of Saudi Arabia (right) in Riyadh to discuss Syria. Photograph: AP. May 21, 2012 -- Antipodean Athiest, submitted to Links International Journal of Socialist Renewal by the author-- In April 2012, a number of high-level political officials attended conferences in Paris and Istanbul organised by the Friends of Syria group. US secretary of state Hillary Clinton attended these meetings, and joined the foreign ministers from the NATO powers and Arab Gulf monarchies in denouncing the killings committed by the Syrian regime of Bashar al-Assad.